In its continuing effort to harmonize PTO handling of patentable subject matter issues with recent Supreme Court and Federal Circuit rulings, and to quell industry concerns about overly restrictive guidelines, on December 16, 2014, the PTO published an Interim Guidance on Patent Subject Matter Eligibility ("Interim Eligibility Guidance"). This article will discuss the Guidance and the analysis provided by the PTO at a January 21 Eligibility Forum. Alice was ‎decided, and ‎supersedes the March 4, 2014, Procedure for Subject Matter Analysis of Claims Involving Laws of Nature/Natural Principles and Natural Phenomena ("March 2014 Procedure") based on the Myriad and Mayo decisions. The Interim Eligibility Guidance represents a substantial ‎modification and simplification of the March 2014 Procedure. The January 21 Eligibility Forum included comments on the Interim Eligibility Guidance provided by senior PTO officials Raul Tamayo and Drew Hirshfeld, as well as other PTO officials involved in drafting these publications. Comments were also solicited and provided by industry representatives, the ABA Section of Intellectual Property, the AIPLA and others. The Interim Eligibility Guidance ‎is in some respects a response to the life sciences industry's criticism of the PTO's March 2014 Procedure, which was seen as being overly restrictive in the application of Myriad. But, as explained by Raul Tamayo at the January 21 Forum, the principal difference between the latest guidance and earlier versions is that the PTO now combines the life sciences analysis with that for software and business method patents. 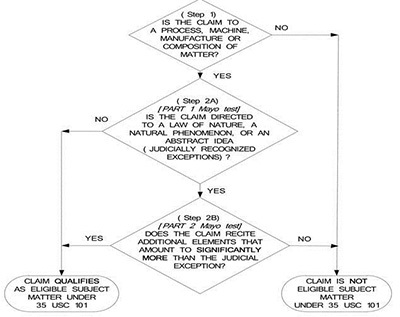 Thus, as shown in the flow chart included in the Interim Eligibility Guidance, the same two-step Alice process is applied, whether dealing with a biological process claim that might be considered being directed to laws of nature or natural phenomena, or arguably directed to a business method within the abstract idea exception, whether implemented on a computer or not. Initially, it needs to be understood that examiners are to use the broadest reasonable interpretation of the claim, analyze the claim as a whole, and practice "compact prosecution" covering all of the issues under sections 101, 102, 103 and 112. With these ground rules, Step 1 of the flow chart can be considered. There is nothing new in this first step of the flow chart. It simply asks if the claim is directed to one of the categories set forth in section 101. Step 2 A is different from the March 2014 Procedure in that it presents a comprehensive test for all claims, whether they be to a product or a process, or involve the abstract idea, law of nature or a product of nature exception. If the answer is no, the examination proceeds to 102, 103 and 112 issues. If the answer is yes, the examiner proceeds to 2B. But before moving down to 2B, consideration must be given to the fact that nature-based products derived from natural sources require closer scrutiny to determine if they fall within a judicial exception. Whether something is an eligible nature-based product or whether there is an issue with a judicial exception is going to come down to the "markedly different" analysis. As explained at the Forum, eligible nature-based products are those that exhibit markedly different characteristics based on structure, function, and/or properties. As to these products, Step 2B can be skipped, and the claim qualifies as eligible subject matter under section 101. Ineligible nature-based products that are either naturally occurring or have characteristics that are not markedly different from a natural category, are going to give rise to an exception, and the analysis has to pass down to Step 2B. This is a change from the March 2014 Procedure; that is, the "markedly different characteristics" path to eligibility no longer requires the "significantly more" analysis of last March. As explained at the Forum, PTO staff looked at the examples of characteristics that the Supreme Court and the Federal Circuit consider when they determine whether there is a marked difference. Based upon recent and historic patentable subject matter case law, there are four different groups of characteristics that have been considered: biological or pharmacological functions or activities; chemical and physical properties; phenotype, including functional and structural characteristics; and structure and form, whether chemical, genetic or physical. If the claim includes a nature-based product that has markedly different characteristics based on the above tests, the claim does not recite a "product of nature" exception and is eligible (so the answer in Step 2A is NO). If the claim includes a product having no markedly different characteristics from the product's naturally occurring counterpart in its natural state, the claim is directed to an exception; Step 2A is YES, and the eligibility analysis must proceed to Step 2B. In the event 2A potentially relates to an abstract idea, Mr. Tamayo referred to the examples of abstract ideas noted in Alice: fundamental economic practices, methods of organizing human activities, ideas in and of themselves, and mathematical relationships and formulas. The Interim Eligibility Guidance actually refers to thirteen examples of instances involving the judicially recognized exception of abstract ideas: mitigating settlement risk,  hedging,  creating a contractual relationship,  using advertising as an exchange or currency,  processing information through a clearinghouse,  comparing new and stored information and using rules to identify options,  using categories to organize, store, and transmit information,  organizing information through mathematical correlations,  managing a game of bingo,  the Arrhenius equation for calculating the cure time of rubber,  a formula for updating alarm limits,  a mathematical formula relating to standing wave phenomena,  and a mathematical procedure for converting one form of numerical representation to another. Step 2B asks whether the claim recites "significantly more than the judicial exception." Mr. Tamayo explained that this analysis needs to ask whether the limitations of the claim as a whole do enough to render this claim something more than simply the judicial exception. The PTO went to the case law to determine the types of limitations that courts have said are enough to bring the claim into the realm of eligibility. In summary, Step 1 is the same as the prior guidelines, and simply looks to see if the claim as a whole falls into one of the four categories. Then, Step 2A asks if the claim is directed to an exception. If so, Step 2B presents the "significantly more" analysis. If the answer to Step 2B is "Yes," then you have an eligible claim and the examiners are going to move on to the other statutory requirements. If it is "No," that is where you have an eligibility problem but the examiners are still going to move on to the other statutory requirements, practicing "compact prosecution." The PTO speakers at the Forum noted one final change presented in the Interim Eligibility Guidance; that is, the streamlined pathway to eligibility. Under this practice, it is possible for an examiner to conclude that the claim clearly does not seek to tie up a judicial exception. For example, the Interim Eligibility Guidance talks about a prosthesis covered with what appears to be a naturally occurring mineral. Depending on the way the invention is claimed, it is possible that the applicant is not trying to tie up the naturally occurring mineral. In that case, the examiner can proceed without doing the full analysis as long as there is no doubt in the examiner's mind that the applicant is not seeking coverage for the judicial exception itself. 1 Alice Corp. Pty. Ltd. v. CLS Bank Int'l, 573 U.S. ___, 134 S.Ct. 2347 (2014). 2 Bilski v. Kappos, 561 U.S. 593 (2010). 3 buySafe, Inc. v. Google, Inc., 765 F.3d 1350, 112 USPQ2d 1093 (Fed. Cir. 2014). 4 Ultramercial, LLC v. Hulu, LLC and WildTangent, 772 F.3d 709, 112 USPQ2d 1750 (Fed. Cir. 2014). 5 Dealertrack Inc. v. Huber, 674 F.3d 1315 (Fed. Cir. 2012). 6 SmartGene, Inc. v. Advanced Biological Labs., SA, 555 Fed. Appx. 950 (Fed. Cir. 2014) (not precedential). 7 Cyberfone Sys. v. CNN Interactive Grp., 558 Fed. Appx. 988 (Fed. Cir. 2014) (not precedential). 8 Digitech Image Tech., LLC v. Electronics for Imaging, Inc., 758 F.3d 1344 (Fed. Cir. 2014). 9 Planet Bingo, LLC v. VKGS LLC, 576 Fed. Appx. 1005, 2014 U.S. App. LEXIS 16412 (Fed. Cir. 2014) (not precedential). 10 Diamond v. Diehr, 450 U.S. 175 (1981). 11 Parker v. Flook, 437 U.S. 584 (1978). 12 Mackay Radio & Tel. Co. v. Radio Corp. of Am., 306 U.S. 86 (1939). 13 Gottschalk v. Benson, 409 U.S. 63 (1972). 14 Mayo Collaborative Services v. Prometheus Laboratories, Inc., 566 U.S. ___, 132 S.Ct. 1289 (2012). 15 Alice Corp., 134 S. Ct. at 2359. 16 Bilski, 130 S.Ct. at 3227. 17 Diehr, 450 U.S. at 184. 18 Mayo, 132 S. Ct. at 1299, 1302. 19 Alice Corp., 134 S. Ct. at 2360. 22 Mayo, 132 S. Ct. at 1297-98. 24 Alice Corp., 134 S. Ct. at 2359. 26 U.S. Patent No. 6,993,572 (filed on June 11, 2003); see also, U.S. Patent No. 7,818, 399 (filed on Jan. 30, 2006). 27 University of Utah Research Foundation, Myriad Genetics, Inc., et al. v. Ambry ‎Genetics ‎Corporation, 2014 U.S. App. LEXIS 23692 (Fed. Cir. Dec. 17, 2014). 28 Ariosa ‎Diagnostics, Inc. v. Sequenom, Inc., Fed. Cir. Case No. 2014-1139.